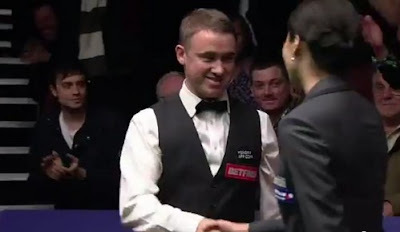 World Snooker Championship Day 1: Stephen Hendry made a fantastic maximum at the Crucible during the first session of his match against Stuart Bingham. Hendry, who just returned from China on Friday with no practice to play the match today. However he proved that he was in a fantastic form. Hendry showed his form by making breaks of 100, 89, 78 and 61 to go 5-1 up on Bingham before the magic 147 in frame 7. Hendry showed no signs of nerve when he was going for the maximum including potting a few difficult balls. A sensational 147 is then produced. This is the eleventh maximum of the seven-times World Champion, his third 147 (1995, 2009, 2012) at the Crucible. This also helps himself to level off the record made by Ronnie O'Sullivan last August. Zhu Ying, the first Chinese female Referee making her debut at the Crucible today officiated the magic moment. Hendry picked up 50000 pounds for this maximum. Congratulations! Hendry after making the maximum: "I felt really good out there, and the jetlag - well, sleep is for wimps. It's the new way, fly in to Sheffield the day before with no practice!'' He added,"That ties with me with Ronnie to have made three here, and I don't care what Mark Williams says about the Crucible, there is no better feeling than to make on here." It is never easy for the 43-year-old to pass this year. Last year right here at the Crucible, after losing to Mark Selby in the second round considered to retire from the circuit as he may drop out of Top 16 after his defeat. Fortunately, Hendry's ranking stayed in the 16th but the happy days are not long. He dropped out of Top 16 for the first time in years at the first cut-off point of this season. Many people doubt if he will be playing his best again. Hendry proved himself by playing better this season, beating players like Neil Robertson and Martin Gould to reach the second round of some ranking tournaments. He led Bingham by 8-1 after first session, requiring just two more frames to win tomorrow. I am delighted for Hendry and indeed his fans. 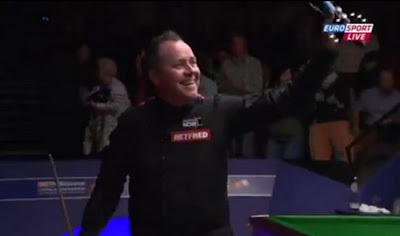 The Defending Champion John Higgins beaten Liang Wenbo by 10-9 after trailing 6-8. The Wizard of Wishaw narrowly led Liang by 5-4 after first session today and struggled during the night session. Higgins may face his fellow Scotsman Hendry in last 16, "I'm just delighted to win and it looks as if I'll be playing Hendry which would be great because I've never played him here." Neil Robertson has an extensive advantage on Ken Doherty after wrapping up the first session, 7-2. Doherty was going for maximum (before Hendry did) this afternoon as well but failed on the 14th red. Martin Gould is in trouble as he was 3-6 behind David Gilbert and Haikou World Open Winner Mark Allen trailed Crucible Debutant Cao Yupeng by 4-5 after first session.